April 2012 - Liftomatic™ Material Handling Inc.
As it turns out, the President and the Nuclear Regulatory Commission just approved their first nuclear power plant in 34 years’ time. This isn’t to say that other nuclear reactors haven’t been built in America after 1978; it’s just that 1978 was the last year that a new nuclear construction project was approved, and nuclear power plants take a considerable number of years to get up and running from planning through execution. But that’s all about to change. As of February 9th of this year, the U.S. Nuclear Regulatory Commission approved the licensing and construction of a pair of shiny, new nuclear reactors for Southern Co.’s Vogtle, GA site, just south of Atlanta. Apparently nuclear power hasn’t gone the way of the dinosaur or Cold War. Rather, its peaceful civilian applications continue to flourish. It wasn’t so long ago (back in the early 80s) that Liftomatic helped in building a nuclear power plant in Zion, IL. Building a nuclear power plant is a little like the modern equivalent of building a cathedral, if only in the sense that the building process is painstaking and takes many years to complete. In this case, the energy company we were working for had gotten around to building one of the cooling towers for the plant. It was a fairly monumental job. They required 50-60 steel drums atop the tower to provide coolant for the new reactor, but they’d run into something of a dilemma: the cooling tower stood 70-80’ high in the air, far beyond the reach of even the energy company’s tallest vertical lifting cranes. Prior to our work at Zion, we had always used forklift handlers to lift barrels up to where they needed to go. But seeing as this would be possible under the circumstances, we decided on a radical approach to solving the problem: we hired a Sikorsky transport helicopter to help us lift the drums atop the tower. Taking our customary Liftomatic material handling hooks and beaks, we attached them to the helicopter, and then attached the steel drums to the drum-handlers. The end result? Besides providing a lovely “Kodak moment”, with said Sikorsky sailing through the air en route to the tower’s pinnacle, our solution proved a success. All drum barrels were lifted into place on that day. By hook and by helicopter, Liftomatic ended up saving the day. Prior to our work with the Zion facility, most of the common uses for Liftomatic equipment had been with forklift attachments but we had a new 4-drum crane-mounted attachment available. After discussing the dilemma with the plant’s construction manager, he advised that they had a large Sikorsky helicopter available. In no time, the pilot of the helicopter was “on board” with the plan and attaching the model L4CB below-hook attachment to his lifting gear on the helicopter. The end result? Besides providing a lovely “Kodak moment”, with said Sikorsky sailing through the air enroute to the tower’s pinnacle, our solution proved a success. All of the drums were safely and efficiently lifted into place on that day. By hook and by helicopter, Liftomatic equipment ended up saving the day. We made a leap as a company in the late 1980s and early 90s by looking for opportunities to develop beyond North America. One of the emerging markets abroad that intrigued us the most was China. Here was a market suddenly laid open to foreign investment that had for many decades been strictly controlled by a central government; one that potentially contained one billion customers. Here was a monumental business opportunity if ever there was one. When we first landed in Beijing in 1989, what we discovered a city that was caught in the throes of modernization. Huge discrepancies immediately leapt out at us. We couldn’t help but notice the hundreds and hundreds of contemporary high-rises (with their attendant construction cranes) that dotted the skyline, and how this evidence of economic progress seemed to jar with what we saw in the streets: millions upon millions of commuters entirely reliant upon bicycles to get around the city. 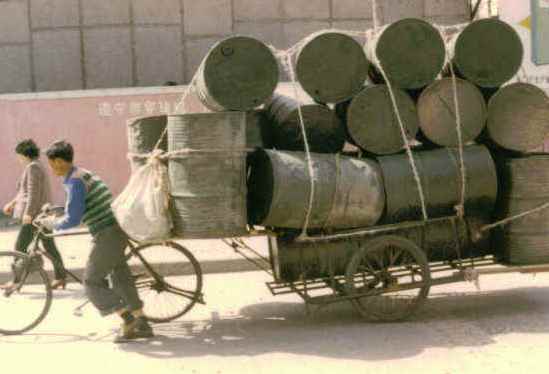 The photograph I took of a Chinese worker peddling a bicycle as it towed a series of steel container drums has never ceased to amaze me. It seemed to me that time in the streets was still waiting to catch up with the ambitious pace of the new city skyline. It seemed to me to be a huge opportunity in the making. We’ve been in business in China for 23 years now. It hasn’t exactly been easy money. We came at a time when plenty of other Western companies were picking up interest in doing business with China, and time and again, we had to carve our niche against fierce competition. This isn’t to say that we didn’t succeed. In fact, 25-30% of our business now comes from mainland China. Thanks in part to us, that picture of a bicyclist peddling steel drum containers has long-since been replaced by a modern forklift carrying steel drum containers gripped by modern drum-handling equipment. After all that’s been said and done; after all the travel costs, official meetings, and unofficial toasts that we’ve been through in China, we’ve calculated that we’ve added 8% to our bottom line by doing business there, a job well-done by any company’s standard.